With Cannes Lions 2016 on the horizon, Google has just released its special edition Cannes YouTube Ads Leaderboard celebrating the most popular global video ads since last year’s festival. Groove Jones’ work for the Xfinity NASCAR Virtual Reality experience was recognized as a Top 10 video! Dallas based VR studio Groove Jones worked with the NY Agency Office of Baby on the campaign. The list of top ads represents the top viewed videos of 2016 so far and collectively represents 20 million views. Brands represented include food, car and sports brands. 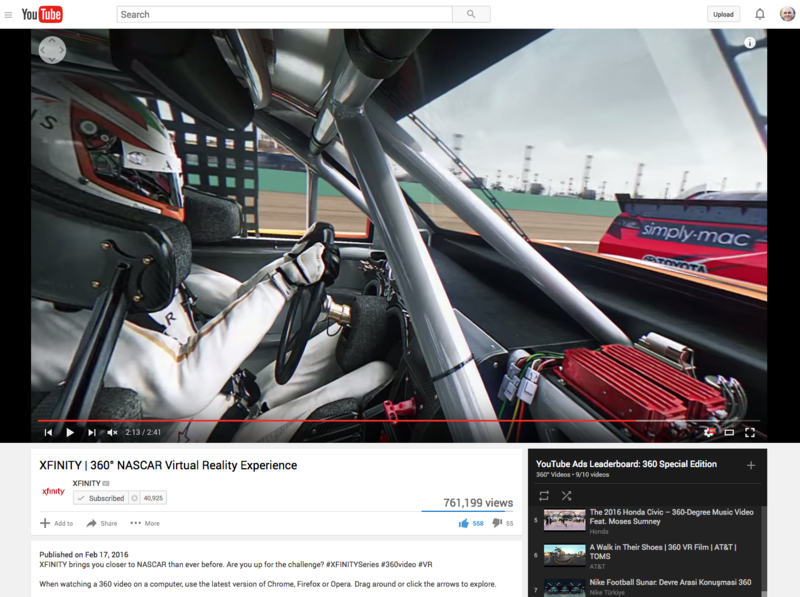 For the first time, Google announced the Top 10 360º Videos on YouTube and our work for the Xfinity NASCAR campaign made it. Check out the awesomeness. Here are the top 10 YouTube Ads Leaderboard: 360 Special Edition, which was unveiled at the international ad festival in France, Cannes Lions. Other brands that have been recognized for their work on the inaugural leaderboard. The YouTube Cannes to Cannes Ads Leaderboard is a list of the top 10 most popular video ads globally from March 2015 to April 2016. The ranking is determined using YouTube’s signals of viewer choice, including factors like watch time, views, and mix of paid/organic views.